Last week I asked on Facebook what everyone’s favorite cookies were. My friend Jami suggested a few different recipes, including this chocolate/peanut butter cookie that has not only chocolate chips, peanut butter chips, and Reese’s Pieces, but peanut butter cups as well. Hello peanut butter! I couldn’t wait to make these. Since I’ve been working from home lately, I’ve lost my coworker guinea pigs and am now always looking for opportunities to try new recipes. Fortunately for me, every few weeks, my friends and I have been meeting up at a local bar for a night of pub trivia. Yes, it’s what it sounds like–trivia at a bar. It’s fun, I swear! Anyway, the last couple of trivia nights I baked cookies and shared them with my team (aptly named, “Don’t toss the cookies”). We’ve even been sharing with the waitress who declared these cookies her favorite thus far (she even liked them more than the brown sugar cookies!). I thought they were good, but not my favorite. The chocolate is pretty subtle, but if you’re a peanut butter fan, these are definitely the cookies for you! In a large bowl, cream together the butter, peanut butter, white sugar, and brown sugar until smooth. Beat in the eggs one at a time, then stir in the vanilla. Combine the flour, cocoa, and baking soda; stir into the peanut butter mixture. Mix in the chocolate chips, peanut butter chips, and Reese’s Pieces. Drop by tablespoonfuls onto ungreased cookie sheets. Push one peanut butter cup half (I used two mini Trader Joe’s peanut butter cups) into the center of each ball of dough. Bake for 8 to 10 minutes. Let cool for 1 or 2 minutes on sheet before removing, or they will fall apart. Recipe adapted from Cookie Madness via Night Baking. I wish there were Trader Joes near me, I want those mini PB cups!!! First off, I love your blog! It’s so neat and well organized. I’m envious ;). Mostly I wanted to say thanks so much for linking back to me. 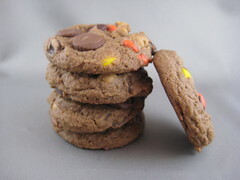 This is one of my all-time favorite cookie recipes from allrecipes. The funny thing is how different the photo on allrecipes.com looks from yours and mine. My cookies were much darker for some reason and didn’t spread as much. I’ve made them several times and they always turn out the same way. @Anna – Thanks! Regarding the color, I think some of the people on All Recipes omitted the cocoa, because I was reading the comments and some of them mentioned that. I may try it that way, because I think a purely peanut butter cookie may make them even yummier! thnx for the delicious recipe! These look super delicious and as a great alternative to making another chocolate peanut butter pie! That is bananas! What a crazy, and mouth watering idea! They have those mini PB cups at some bulk food stores, too. Thanks so much for posting this. Sounds wonderful – I may have to try these soon! PB & chocolate are one of the great combos – always a crowd pleaser! these look so yummy! 😉 i made some fudge puddle pb cookies recently, a slightly new take on the good old pb choc chip cookie and they were really scrumptious! check them out and let me know what you think!